For 100 years or more, the best salespeople have been slowly developing and cataloging best practices for their own use: secrets of gaining competitive intelligence, lead generation, strategies to overcome objections, creating business value through their solutions, insights into prospect psychology (with different strategies for different types of buyers), presentation and sales letter skills and more. And yes, some of this wisdom found its way into books and manuals. But nowhere was it all assembled at once—until now. With the publication of Sales Encyclopedia, business people finally have a single-volume source for information on every facet of the sales process. In 47 chapters and 678 pages, six authors with a combined 141 years of sales experience guide both new and experienced sales people through every step of selling. The authors’ clear, easy-to-digest style provides a comprehensive guide that will enable business people to gain the equivalent of years of experience. Assembled from decades of professional practice, study, and training, this exhaustive (but not exhausting) and definitive examination of traditional success secrets is designed to be consumed in chunks: when a salesperson runs into a confusing or difficult situation, he or she can consult the appropriate chapter or section. 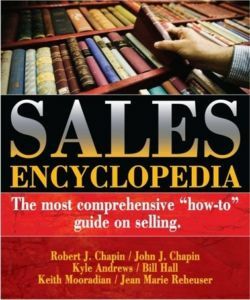 Sales Encyclopedia includes considerable information that is not available anywhere else. Utilizing the principles will elevate your sales process and enable you to win more deals, and more profitable deals. To order Sales Encyclopedia, visit www.amazon.com, www.barnesandnoble.com or www.completeselling.com.